When we were approached by YPTE we wanted to come up with a clean and simple design that could easily be used by various users and age groups across a multitude of devices. The website is responsive therefore it adapts to the device that the user is viewing it on whether is is a desktop computer, tablet or mobile, helping to make YPTE’s learning resources very accessible. The website is a bespoke ‘Ruby on Rails’ application, it takes advantage of the latest technologies and recent advancements in search engine optimisation to be able to give visitors a fast, fluid experience whilst giving excellent search engine rankings. Behind the scenes YPTE staff have an easy to use admin system that allows them to write new factsheets, post the latest news, add interesting videos, create photo galleries and more to help keep their site up to date and push new content through to their users. With the YPTE website being very content heavy we wanted to make it easier for people to find what they are looking for without having to search through the whole website, an easy to use resource browser allows users to either type in the name of the learning resource they are looking for or filter results by topic, resource type or audience to find exactly what they are looking for. 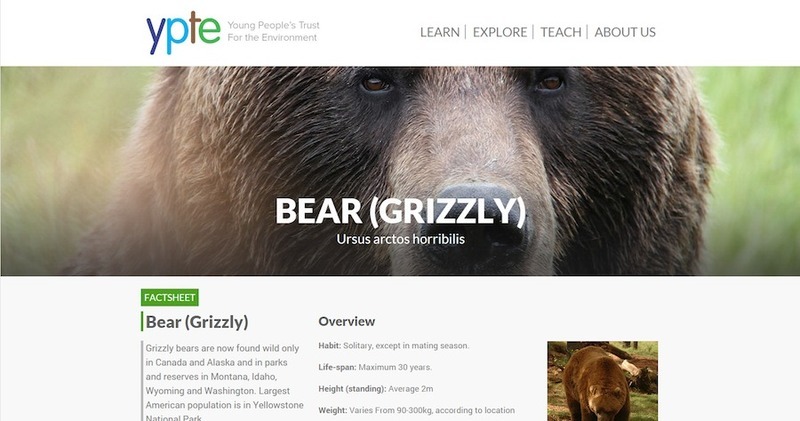 The resource browser makes resources such as factsheets easier to access and navigate to, a big plus for teachers looking for specific resources to assist them in teaching young people about the importance of sustainable living techniques and environmental issues. One benefit of YPTE being a Charity is that we have access to thousands of high quality, open source images on Flickr, we assisted the Charity in sourcing and using the hundreds of great images in use on the site that really help to bring the site alive and make it more approachable. Another benefit of YPTE being a charity is that we were able to apply for a Google Grant which we successfully achieved therefore we have access to $10,000 a month of Google Adwords advertising credit. Every single animal or environmental factsheet on YPTE has specific ads that we’ve created, these adverts appear at the top of Google’s search results giving the site the opportunity to boost traffic to their website by targeting the adverts at the right people. On behalf of Ziontech Solutions we have thoroughly enjoyed working on the YPTE website and would like to wish all the best to Peter and the YPTE team.